In this week’s Weekly Tax Planning Tip video we’re sharing 3 tips to spot potential investment scams if you’re considering private investments. You can also check out the Financial Post article we wrote on this if you want to dive in further. Click here to check it out. Hey guys, how are you? So today’s topic is going to be about private investments and spotting the potential investment scam. I’m going to give you three tips on this. So what do I mean by private investments? Uh, that would be opposed to let’s say a registered mutual fund or a stocks trading on the stock exchange or something that you get at the bank, like a GIC. Okay? So private investments, you’ve got to do a little bit more due diligence on them before you put your money into anything like that. The first thing that you’re going to want to do is really scrutinize the promised returns. So if someone is coming to you and promising, you know, double-digit return saying that there’s somehow guaranteed, that’s the first sign of a potential scam or potential oversell by the person’s selling. We’re manufacturing the investment. So think about it like this. If GICs are paying two and a half percent and someone is telling you that you are guaranteed a 12% consistent return on investment, why would anyone in the world by GIC, they would all buy this particular investment? Okay? So that’s the first sign. I’m not saying that you can’t generate an excellent return, but is it really guaranteed? The second is oversight, regulatory oversight. Is there any regulatory oversight? So for example, a hedge fund or private equity fund will usually be regulated by the OSC, the Ontario Security’s Commission. There will have to be an offering memorandum. There will most likely have to be an independent administrator, so on and so forth. Is there some sort of regulatory body overseeing this type of investment in this regulatory body? Is this a regulatory body that you can verify the investment? Is there, is this a regulatory body that you can complain to if something goes wrong? The third is there any independent oversight of the financial reporting for this particular investment? So once again, with hedge funds, private equity funds are more sophisticated. 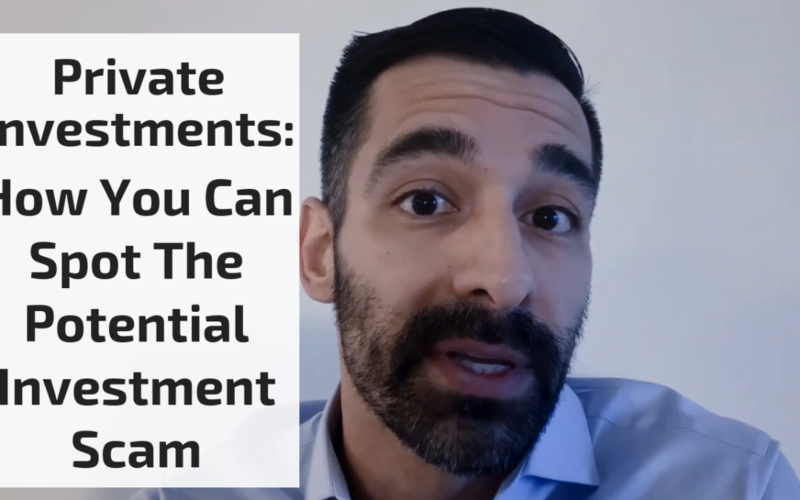 Private investments, they’ll most likely have an independent administrator that administers their quarterly or monthly reports independent of the Fund and the fund manager. There’s for sure going to give you an independent auditor, you know, all a big four firm or a mid-tier firm that is qualified to provide oversight of the financial reporting, recalculate, return on investment, you know, prepare the tax slips, so on and so forth. So if you don’t have these three things lined up really, really well, I would probably stay away from any potential investment, private investment, mainly you just don’t know what’s going to go wrong or what potentially could go wrong. So once again, that’s going to be ridiculously high promised, guaranteed returns. Okay. Uh, lack of regulatory oversight and lack of independent oversight of the numbers. So I did write an article for this, uh, for the financial post. We’ll post the link to this in the notes below, but, uh, if you have any more questions about something like this, feel free to call us or contact us. All of our contact information is on cmllp.com and see you next time.